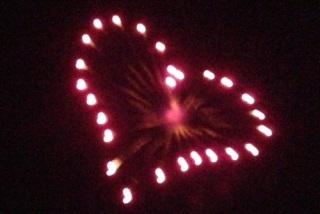 Fireworks launched just right form a heart, the symbol of Uruma City. It has been 10 years since Uruma City was formed when Gushikawa and Ishikawa cities and Katsuren and Yonashiro towns were merged into one municipality. The city currently has about 120,000 residents making it the third largest city in the prefecture after Naha and Okinawa City. 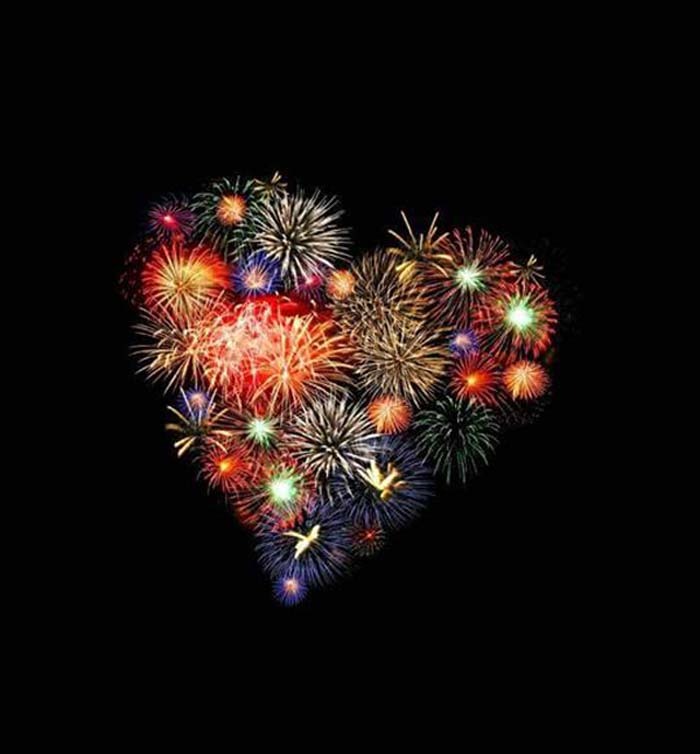 A heart made with a single piece of fireworks. The new city was officially formed on April 1, 2005, but volunteer members from local civic groups like local Junior Chambers of Commerce, PTAs and groups from local companies have decide to give the 10 years of Uruma City one more hurrah on Dec. 31st. That the date when the groups have decided to launch 108 fireworks on the New Year’s eve from Ayahashi Umi-no-Eki (Sea Station) on the Kaichu Road that connects Yonashiro to Henza Island. The figure of 108 comes from the Japanese tradition of ‘Joya no Kane’ that is a bell at shrines rung 108 times to ring in the New Year. Participating groups have decided to set up the fireworks instead of ringing a bell in order to have their message seen and heard wider. The festival itself will start much earlier at 15:00 before the fireworks and is scheduled to feature plenty of events for the whole family, such as hero shows, Ryukyu Dragon Pro-wrestling performances and live music shows. The countdown with 108 fireworks is scheduled to begin at 23:50, followed with another show of 400 fireworks and a live concert by band called ‘Urumanian’ that will run through 12:30.